A Valentine’s Day is a special day (which happens every year on the 14th of February) of all beloved, enamored and close friends to show how much they love and appreciate each other. It is very significant not to forget about your girlfriend/boyfriend or just a very close friend (if you don’t have the one mentioned above) and remind them how much you appreciate and love them. Everyone knows that if you show them a little bit of respect and attention, or take an interest in them, or amaze them with some strange but good enough actions or small gifts on this magical day, you will receive much more attention from them and, moreover, it’s so pleasant to give presents, isn’t it? So, why not surprise your loved with such great things like icons and elements, backgrounds or illustrations when they’re totally free for this famed day when all people all over the world do something special for ones they love and admire? The first things I want to tell you about our magnificent icons and lovely little elements for Valentine’s Day which definitely will be liked by your sweetheart. The elements are small pictures on different topics concerning love, admiration, appreciation and affection colored with different bright colors and showing enamored hearts, sincere love letters, colorful balloons and many other things that are exactly to your honey’s liking! The icons are similar things but often done in a one-color scheme or having a similar shape which fit a love letter (also planned in one color) you’re writing to your loved one or a picture you’re creating for him or her in order to show your fondness and friendship. So, don’t make haste, look through (but carefully) these icons and elements I give to you and choose only ones you like and think they will perfectly fit your present or letter or anything you come up with, but don’t forget about your sweetheart’s taste and anything he or she would like to get from you. Just look at this little cute owl and yummy cakes, but don’t forget it’s just a preview and to see more elements go and download it here. 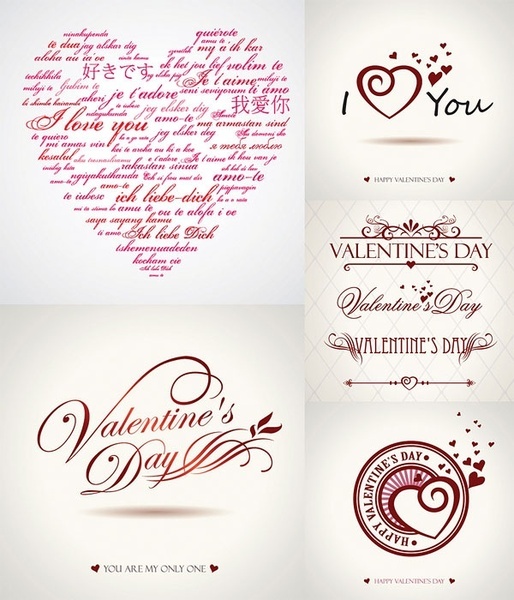 These elements are just for real romantic people and if you are or your honey is, download it. Get this bundle of cute things here. Express your wishes with this one! For anything like the previous one but a little bit sweeter, go here. Circle icons! Why not download the pack of circle ones? If she likes pink, get little pink icons here! We need more pink in our grey world! If you’re tired of pink you can download these colorful icons! Red is a color of love and passion so go here. The next things I want to tell you about our colorful backgrounds for Valentine’s Day which you can place the wishes and words of gratitude and love on to the one you love and feel the passion to. The background is a large picture which can have different bright colors or just some colors of the same color scheme on it or just one of the colors and it is often with little or huge elements on it. If you are creative enough you even can make a large poster for your beloved with a lot of mutual photos you’ve been doing for the period of time you’ve been dating so far and write wishes for her or him, your feelings and how much you love and value him or her. These minimalistic big pictures can be a great solution when you want something literally to be on your background, so check out the following ones and think already about the special present you want to give your sweetie. What can be better than lovely pinkish clouds which you can download here? Hanging cute hearts can be downloaded just right here. For the white soft background with subtle pink notes go here. For more pink and purple hearts go and check this one. Clouds and hearts can even be combined here! If she likes pink you should choose this one here! Or if it’s too much red, check out this one! If you like this one, you have a great taste so download it! The last and the most unique things I would like to tell you about are illustrations for Valentine’s Day which can create the atmosphere of a captivating fairy tale every single girl want to be plunged at. The illustration is one picture (often a pack of a few of them) which can tell us the whole story about something or someone and it can be used in a nice postcard or in a poster telling the story of your living together. The set of various illustration can help you to replace the whole set of words and long phrases in your outspoken love letter or in a lovely postcard you write for your sweetheart and they can even contain literally whole phrases! So, don’t waste your time now, go and check out some illustrations for Valentine’s Day I have for you and think of the way you would like to apply these sweet illustrations for your only one love in your life! What I was talking about are literally whole phrases can be found here! These phrases which you find here could be even designed in this unusual way! Let’s have fun with these childish things which you can find here. These kitties are so cute, aren’t they? What about these kitties and puppies? Not without some gloomy hearts for pessimists or just for mixing up the atmosphere of pinkish fun. One more pack of black hearts. When you don’t like black hearts, we have a great bundle of these pinkish ones! What about this bundle of phrases? So, as you can see I presented you a few of the most convenient ways of how to brighten the upcoming Valentine’s Day with free graphics and to surprise your sweetie beginning with icons and elements which are tiny things of different objects that can complete any postcard or present you want to give to your beloved. Then I spoke about backgrounds of different styles, colors, and shapes which are actual backgrounds and gave you an idea of creating a poster for your sweetheart. Later I was finishing with a set of illustrations that can be added in a present instead of words and whole phrases what is very helpful when you lack imagination or just don’t know how to come up with something. At this point, I will finish, leaving you thinking about the present for your beloved and hoping I helped you and you already know how to amaze your beautiful princess or your brave knight and I will also be preparing for the upcoming Valentine’s Day, brewing green tea because this is my favorite.